Organic. 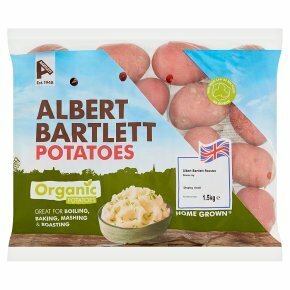 Best for boiling, baking, mashing and roasting.Albert Barlett Organic Rooster Potatoes are grown in Scotland to rigorous organic standards. Be Inspired Our Rooster potatoes have a classic potato taste. Try them baked, mashed or roasted for a perfectly delicious result every time. Remember, there's no need to peel either; it means you will get a crunchier bake and a rougher mash. Boiled Potatoes1 Peel and cut into even pieces.2 Place in a pan of cold water.3 Bring to the boil and then gently simmer until tender (20-25 minutes).Tip: Try steaming instead of boiling - it keeps in more flavour. Dauphinoise Potatoes1 Preheat oven to 160°C / Fan 140°C / Gas mark 3.Peel and thinly slice half a bag of Rooster potatoes, then toss with salt, pepper, nutmeg and 350ml double cream.2 Rub a shallow baking dish with a cut garlic clove.Spread the potatoes and cream mix in the dish, pressing down the mixture evenly.3 Cover the dish with foil and bake in the oven for 30 minutes. After this time, remove the foil, turn up the heat to 200°C / Fan 180°C / Gas mark 6 and cook for a further 15 minutes.Tip: Leave to cool for 10 minutes before serving with a meat dish. A lamb joint is particularly delicious!